تفرشی, مهشید, الله کرم, سعیدرضا, فرهنگی, حسن. (1395). تأثیر دمای آبکاری بر ترکیب شیمیایی، سختی، مورفولوژی و رفتار خوردگی پوشش‌های آلیاژی Zn-Ni. 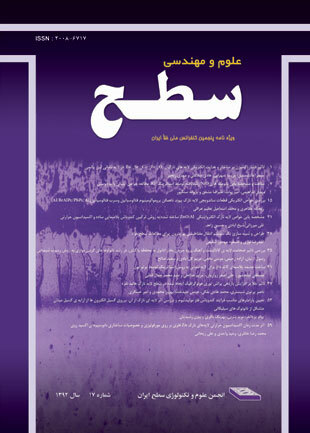 نشریه علوم و مهندسی سطح, 12(28), 87-98. مهشید تفرشی; سعیدرضا الله کرم; حسن فرهنگی. "تأثیر دمای آبکاری بر ترکیب شیمیایی، سختی، مورفولوژی و رفتار خوردگی پوشش‌های آلیاژی Zn-Ni". نشریه علوم و مهندسی سطح, 12, 28, 1395, 87-98. تفرشی, مهشید, الله کرم, سعیدرضا, فرهنگی, حسن. (1395). 'تأثیر دمای آبکاری بر ترکیب شیمیایی، سختی، مورفولوژی و رفتار خوردگی پوشش‌های آلیاژی Zn-Ni', نشریه علوم و مهندسی سطح, 12(28), pp. 87-98. تفرشی, مهشید, الله کرم, سعیدرضا, فرهنگی, حسن. تأثیر دمای آبکاری بر ترکیب شیمیایی، سختی، مورفولوژی و رفتار خوردگی پوشش‌های آلیاژی Zn-Ni. نشریه علوم و مهندسی سطح, 1395; 12(28): 87-98. در این پژوهش پوشش‌های آلیاژی Zn-Niاز طریق حمام سولفاتی اسیدی رسوب گذاری الکتریکی شدند. تأثیر دمای ترسیب بر میکروسختی، مورفولوژی، ترکیبهای شیمیایی، راندمان جریان کاتدی ساختار و همچنین رفتار خوردگی پوشش بررسی شد. مورفولوژی پوشش‌ها توسط میکروسکوپ الکترونی روبشی (SEM) و ترکیب شیمیایی پوشش ها توسط آنالیزور EDX بررسی شد. به منظور بررسی ساختار کریستالی از آزمون XRD استفاده گردید. جهت بررسی خواص خوردگی پوشش‌ها، آزمایش‌های پلاریزاسیون خطی و طیف نگاری امپدانس الکتروشیمیایی (EIS)دردمای محیط انجام شدند. نتایج نشان می‌دهند افزایش دمای ترسیب، موجب افزایش مقدار نیکل در پوشش، کاهش راندمان جریان کاتدی و افزایش سختی می‌شود. نتایج حاصل از SEM نشان می‌دهد که ساختار در دمای پایین، ریزدانه است و با افزایش دما ساختار درشت دانه می‌شود. جهت بررسی خواص خوردگی پوشش‌ها، آزمایش‌های پلاریزاسیون خطی و طیف نگاری امپدانس الکتروشیمیایی (EIS) دردمای محیط انجام شدند. نتایج حاکی از آن است که پوشش‌های با 14 درصد وزنی نیکل بیشترین مقاومت به خوردگی را در بین پوشش‌ها با ترکیب شیمیایی دیگر دارد. این پوششها به صورت تک فاز است و تشکیل فاز g با ساختار هگزاگونال از عمده ترین دلایل افزایش مقاومت به خوردگی در این پوشش ها میباشد. 1. K. R. Sriraman, H. W.Strauss, S.Brahimi , R.R.Chromik, J.A.Szpunar, J.H.Osborne, S.Yue, Tribological behavior of electrodeposited Zn, Zn–Ni, Cd and Cd–Ti coatings on low carbon steel substrates, Tribology International, 56(2012)107–120. 2. P. Ganesan, S. P. Kumaraguru, B. N. Popov, Development ofZn–Ni–Cd coatings by pulse electrodeposition process, Surface & Coatings Technology, 201 (2006) 3658–3669. 3. A. Agüero, J. C. del Hoyo, J. García de Blas, M. García, M. Gutiérrez, L. Madueño, S. Ulargui,Aluminum slurry coatings to replace cadmium for aeronautic applications, Surface & Coatings Technology, 213 (2012) 229–238. cadmium replacement, Surface and Coatings Technology, 179 (2004) 10–17. 5. P. Ganesan, S. P. Kumaraguru, B. N. Popov, Development of compositionally modulated multilayer Zn–Ni deposits as replacement for cadmium, Surface & Coatings Technology, 201(2007) 7896–7904. 6. A. Conde, M. A. Arenas, J. J. de Damborenea, Electrodeposition of Zn–Ni coatings as Cd replacement for corrosion protection of high strength steel, Corrosion Science, 53(2011)1489–1497. 7. A. Marder, The metallurgy of zinc-coated steel, Progress in materials science,45(2000)191-271. 8. B. Veeraraghavan , B. Haran, S. P. Kumaraguru, B. N. Popov, Corrosion Protection of Steel Using Nonanomalous Ni-Zn-P Coatings, The Electrochemical Society, 150 (4) (2003) 131-139. 9. R.M. Gnanamuthu, S. Mohan, G. Saravanan, Comparative study on structure,corrosion and hardness of Zn–Ni alloy deposition on AISI 347 steel aircraft material, Alloys and Compounds, 513 (2012) 449-454. 10. G. D. Wilcox, D. R. Gabe, Electrodeposited zinc alloy coatings, Corrosion science, 35(1993) 1251–1258. 11. S. Ghaziof, W. Gao, Electrodeposition of single gamma phased Zn–Ni alloy coatings from additive-free acidic bath, Applied Surface Science, 311(2014)635–642. 12. H.Y. Lee, S.G. Kim, Characteristic of Ni deposition in an alkaline bath for Zn-Ni depositional steel plates, Surface and Coating Technology, 135(2000)69-74. 13. X. Qiao, H. Li, W. Zhao, D. Li, Effects of deposition temperature on electrodeposition of zinc-nickel alloy coatings, Electrochemical Acta, 89(2013) 771– 77. 14. L. Tian, J . Xu, S. Xiao, The influence of pH and bath composition on the properties of Ni–Co coatings synthesized by electrodeposition, Vacuum, 86(2011)27-33. 15. S. S. Abdelrehim, E. E. Fouad, S.M. Abdelwahab, Electroplating of zinc–nickel binary alloys from acetate baths, Electrochemical Acta, 41(1996)1413. 16. M. M. Abou-Krisha . F. H. Assaf . A. A. Toghan, Electrodeposition of Zn–Ni alloys from sulfate bath, J Solid State Electrochem, 11(2007)244–252. 17. M. Gavrila, J.P. Millet, H. Mazille, D. Marchendise, J.M. Cuntz, Corrosion behavior of zinc-nickle coatings, electrodeposited on steel, Surface and Coating Technology, 123(2000)164-172. 18. J. B. Baja, Z. Kacarevi´c-Popovi´c, V.B. Miskovi´c-Stankovi´c, M. Maksimovi´c, Corrosion behaviour of epoxy coatings electrodeposited on galvanized Steel and steel modified by Zn–Ni alloys, Progress in Organic Coatings, 39(2000)127–135. 19. L. Sziraki, E. Kuzmann, K. Papp, C.U. Chisholm, M.R. El-Sharif, K. Havancsak, Electrochemical behavior of amorphous electrodeposited chromium coatings, Materials Chemistry and Physics, 133 (2012)1092–1100. 20. K.R. Sriraman, S. Brahimi, J.A. Szpunar, J.H. Osborne, S. Yue, Characterization of corrosion resistance of electrodeposited Zn–Ni Zn and Cd coatings, Electrochemical Acta, 105 (2013) 314– 323. 21. F. Gambina, Corrosion resistance characterization of coating systems used to protect aluminum alloys using electrochemical impedance spectroscopy and artificial neural networks, A Dissertation, Graduate School of The Ohio State University, (2010)14-19. 22. Surviliene, S., A. Lisowska-Oleksiak, and A. Cesuniene, Effect of ZrO2 on corrosion behaviour of chromium coatings, Corrosion Science, 50(2008) 338-344. 23. A. Chitharanjan Hegde, K. Venkatakrishna, N. Eliaz, Electrodeposition of Zn–Ni, Zn–Fe and Zn–Ni–Fe alloys, Surface & Coatings Technology, 205 (2010)2031–2041.